Jim Duffy is author of the recent book, War at the End of the World: Douglas MacArthur and the Forgotten Fight for New Guinea, 1942-1945. He has also written books about FDR and Lindbergh, Lincoln's Navy, and the Czars of Russia. American soldiers of the 32nd Infantry Division land near Saidor. Entire patrols would sometimes disappear in the New Guinea jungle, their skeletons found years later. For nearly four years, they struggled to hold onto the mountainous, jungle-choked island, fighting first with the Australians, then with Americans commanded by Douglas MacArthur. Because holding onto New Guinea was central to the Japanese strategy for the war, they poured a vast number of troops, ships, and warplanes into the effort, pulling away resources from other fronts that contributed to Allied successes elsewhere. Japanese generals interrogated after the war themselves concluded that the New Guinea campaign had contributed a good deal to their losing the war. At the onset of the Pacific War, the Japanese moved quickly in the first steps to creating an empire across the entire western half of the Pacific Ocean and the Southeast Asian mainland. Four hours before Admiral Yamamoto’s carrier-based aircraft swept down on Pearl Harbor on the morning of December 7, 1941, air fleets from the Imperial Japanese Army attacked targets along the Malayan Peninsula, and a land invasion from the north followed quickly. Hacking through almost impenetrable jungle and across crocodile-infested waterways, the crack 25th Army fought its way south, pushing Allied defenders toward the island city of Singapore at the tip of the peninsula. Japanese troops occupied the entire 600-mile long peninsula in less than seven weeks, killing wounded Allied soldiers along their path. On February 15, Singapore surrendered, and more than 100,000 British, Indian, Australian, and Malayan defenders were plunged into brutal, often-fatal, captivity. 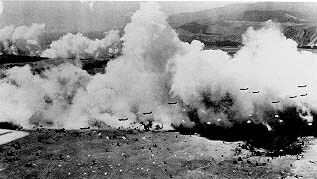 Japan’s forces also quickly toppled Wake Island, Guam, Hong Kong, the Philippines, and dozens of other locations in the central and southern Pacific and on the Asian mainland. Their goal was to seize and occupy resource-rich Southeast Asia, giving them access to the natural resources they lacked—iron, tin, coal, oil, bauxite, rubber, and rice. This would allow them to create a protective perimeter stretching from the Aleutian Islands in the north, down through the central and southern Pacific and around into the Indian Ocean. Tokyo’s propagandists called it The Greater East Asia Co-Prosperity Sphere. In reality, it meant that every person and every resource within that sphere would serve the Emperor. Japan eliminated much of the potential interference from America and Britain by attacking Pearl Harbor and, three days later, bombing and sinking the Royal Navy’s two most powerful ships in Asian waters, the battle cruiser HMS Repulse and the new battleship HMS Prince of Wales. 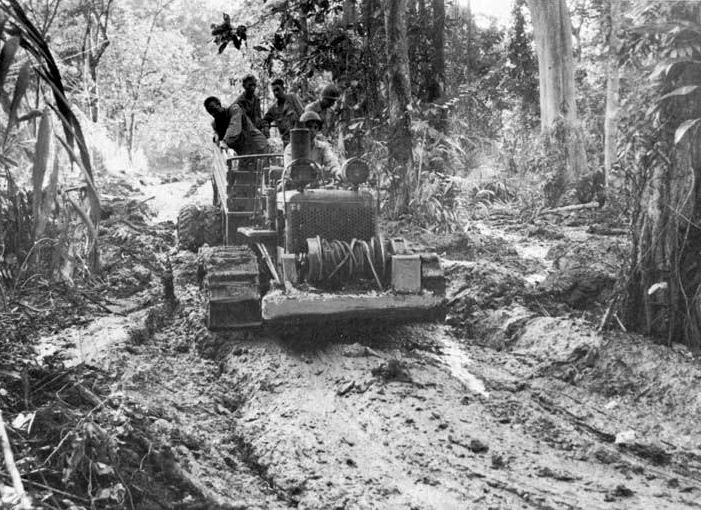 Army engineers struggled to keep roads open through the New Guinea jungle. Flush with victory, Tokyo’s war planners then turned to the question of Australia, the logical place for U.S. and Allied forces to prepare a counterattack. The country was large enough to hold hundreds of thousands of troops and huge amounts of war materiel. It offered deep-water harbors as well as numerous airports from which to sortie. The Japanese knew they had to neutralize Australia, either through invasion and occupation, or by cutting her supply and communication lines to the United States. Capturing and holding New Guinea, only 93 miles from Australia, was critical for Japanese war planners, who hoped to “throttle Australia” while her troops were fighting in North Africa, Greece, and elsewhere. With most regular Australian Army, Navy, and Air Force combat units fighting in Greece, North Africa, and the Middle East, both New Guinea and Australia were particularly vulnerable. Their defense consisted of volunteer militia and support troops. Japanese planners knew it would take months for the crippled American Navy to train and ship forces across the Pacific. The time to strike New Guinea—the gateway to Australia— was now. From January 23, 1942, when their soldiers first landed on New Guinea, until the last holdouts in the mountain jungles surrendered on September 11, 1945 nearly four years later, the fighting was virtually nonstop. The Japanese would pour 600,000 soldiers into the mire of New Guinea, along with dozens of warships and hundreds of aircraft. The more resources they committed, the more important the campaign became to the Imperial General Staff. 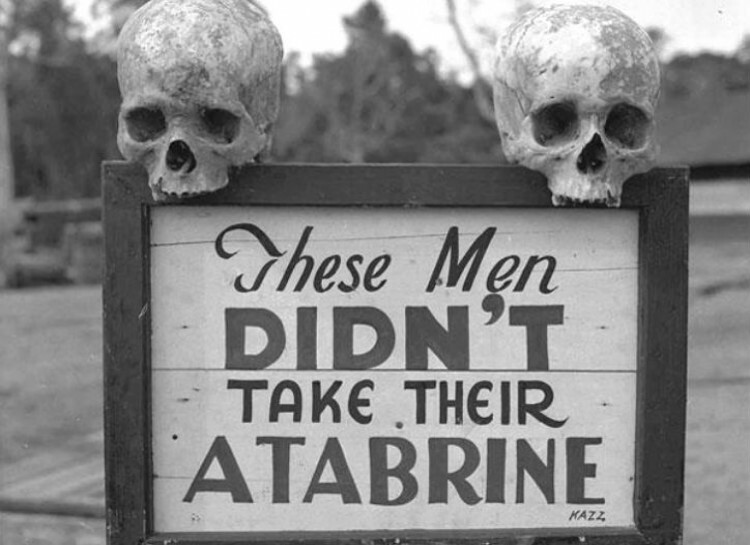 Soldiers in New Guinea fought tropical diseases such as malaria, which could be prevented by taking atabrine, as this sign warned at the 363rd Station Hospital. Disease killed most of the 202,100 Japanese soldiers, sailors, and aviators who died in the New Guinea campaign. The war in New Guinea lasted as long as it did because of the Japanese determination to capture and hold the island at all costs. The soldiers they poured into the fighting tenaciously defended every yard of ground they occupied. They bunkered down in strongholds the Allies found impenetrable, motivating MacArthur’s decision mid-way through the conflict to avoid head-on clashes where possible. He opted instead to surround, isolate and starve large enemy formations, thus saving the lives of thousands of Allied soldiers. 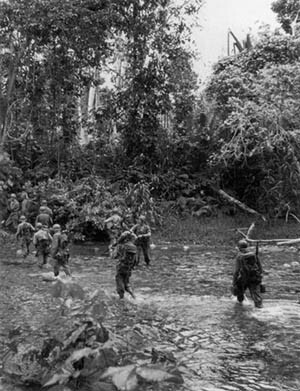 The harsh environment all but eliminated the movement of large troop formations, making the battle for New Guinea often a small-unit, face-to-face conflict. There were some exceptions. One was the three-month long battle for Buna-Gona from November 1942 thru January 1943 during which 24,000 Americans fought alongside a similar number of Australians to dislodge a Japanese army from well-fortified positions. Another is the Battle of the Coral Sea, one of the most famous sea battles of the war, in which Japan fought to gain Port Moresby by sea. When World War II began, the western half of the island was Dutch New Guinea, a colony of the Netherlands. The northeast was New Guinea, and the southeast was Papua, the latter two administered by the Australian government. As a whole, the island (often referred to simply as “New Guinea”) totals 312,170 square miles, nearly twice the size of California. The main island of New Guinea is about 700 miles wide at its widest point, and 1,400 miles long. New Guinea offered some of the most brutal terrain of any theater of war. Then, as now, ten thousand square miles of impenetrable mangrove forests thrived along the coastal areas, especially near river mouths, blocking men and machines from moving inland. And 16,000-foot high mountain ranges covered by tropical jungles dominated the interior of the island. Crossing the island was a life-threatening, torturous expedition. During the war, entire ten-man patrols simply vanished. Skeletal remains later discovered in the thick soggy growth had been picked clean of all flesh by animals and insects. Those who survived patrols found their uniforms ripped to tatters by the razor-sharp kunai grass that often grew ten to twelve feet high. No headway was possible through these grasses without the exhausting use of machetes. The hot and humid zones below the mountains were home to a wide variety of animals. These included crocodiles, snakes, lizards, anteaters, tree kangaroos, wallabies, butterflies with 12-inch wingspans, and more than 600 species of birds, including the five foot tall Cassowary, known to kill a man with a single swipe of one of its dagger-like clawed feet (soldiers were regularly warned to “steer clear” of this most dangerous bird). A soldier’s greatest fear was a tiny scratch that could rapidly become infected and crammed with maggots. The aggressive insect population included malaria-carrying mosquitoes. Thousands of soldiers on both sides died of dengue fever, dysentery, beriberi, scrub typhus, and black water fever (called “break bone fever” by the American soldiers). Some ailments were treatable if aid was close by, others were not. Many men simply wasted away from disease or infections. Death by disease was as prevalent as death by combat throughout the New Guinea campaign. Sudden violent rainstorms regularly transformed the island’s many rivers and streams into torrential floodwaters. One of these swept a Japanese commanding general to his death. Narrow dirt foot trails, the primary means of travel on the island, became mudslides that sent men tumbling hundreds of feet to their deaths. Calf-deep mud sucked soldiers’ boots right off their feet. Typically, soldiers’ boots lasted less than a week before rotting. As many as 300 inches of rain fell annually on parts of the island. According to one American veteran of New Guinea, “It rains daily for nine months, and then the monsoon starts.” The conditions drove some men mad. The neuropsychiatric rate for American soldiers in New Guinea was the highest in the Southwest Pacific Theater, 43.94 per 1,000 men according to one US Army report. But the campaign for New Guinea was much more than a story of disease and death. It was also a story of heroism. Outnumbered and outgunned by the invaders, small units of Australian and New Guinean militia and volunteers did most of the fighting during the first year, blocking the trails across the mountains. Making up for their disadvantage in training and weapons was the local volunteers’ familiarity with the terrain. They fought as snipers, picking off Japanese soldiers forced to walk in single file along narrow paths, or hid in the thick growth to spring larger-scale ambushes. The volunteers’ aggressive defensive actions prevented the Japanese from advancing to Port Moresby on the southeastern side of the island until the arrival of General MacArthur and American troops and equipment. The story of the volunteers is one of heart-breaking bravery. Emboldened by their easy successes throughout the Pacific and Southeast Asia, the Japanese could not know that the island would ultimately break them. The attempt to take New Guinea would stop their juggernaut, just as the attempt to take Moscow broke both Napoleon and Hitler. The similarities between the events in Russia and those in New Guinea are striking. After sweeping across central and eastern Europe in a succession of victories, the Germans were stopped at the Moscow suburbs by a combination of bad weather, difficult terrain, a breakdown in their supply system, and militia-type troops who fought ferociously until regular army units could arrive from Siberia. In New Guinea the Japanese were first slowed by bad weather and difficult terrain that drastically reduced their ability to resupply, then were stopped by militia and volunteer units who fought ferociously until American and then Australian regular army troops could arrive. By its end, the New Guinea campaign killed 202,100 Japanese soldiers, sailors, and aviators, more than half of them dying from disease, untreated wounds, and starvation. The Allies lost 15,000; 7,000 of these were Americans.